We've spent the last several months planning, moving, and creating Deena's new home. While we're still cleaning out the cobwebs we hope you stop by, update your RSS, and come back often. $1 Word Art Kits - TODAY ONLY! Hey There! Happy Friday! Just wanted to spread the word that all of Deena's Word Art collections are on sale (TODAY ONLY!) for $1 each. Yep! There are 13 to chose from! I use these ALL the time, and I love them! Enjoy a little collection of inspiration from our Creative Team using them! Did I mention it's on sale today? Happy Friday!! Enjoy your weekend! You know you want to work on Deena's team! Newly released today (and 30% off, I might add) in my SHOP at Pixels and Company - D-Cuts: Journal Pockets. These easy to cut pockets are great for your project life album, or any hybrid craft. Check out some inspiration from a few of our Creative Team members! Now that you've see a few inpiring ideas, head over and grab this kit! You'll be glad you did. So there really is something for everyone! You don't HAVE to have a cutting machine to use these! Hey There! Happy Friday, It's Tiffany! 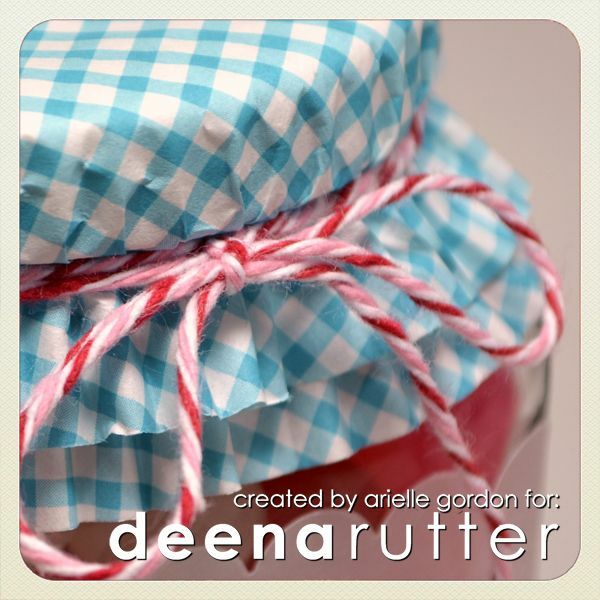 I'm pretty excited to show you Deena's latest release. It's perfect for your project life, to use on a layout, or even to send as a card. Check it out! Not quite sure how to use your Layered Life Templates (ON SALE TODAY IN THE SHOP!) Keep reading for a quick and easy tutorial. Here is a FANTASTIC quick tutorial from our CT member Arielle! Step 1: Open up your file in photoshop. This tutorial is used with Photoshop Elements. Step 2: You should see all of the elements pictured like this. Step 3: Add the papers you want to use about the elements that you would like to change. Step 4: Use a clipping mask first, and then Merge the paper and element together. Do each element/paper selection seperately. Step 5: Your elements will now be covered with your chosen paper. Clip all of these elements with your background layer and you are good to go! Step 6: Now save your card as a .png and you are ready to go!! Thanks Arielle for the fantastic screen shots! Check out what our Creative Team has been creating with the Layered Life Templates! This year my three year old son is in preschool and today, his class is having a Valentine’s party! It’s his first Valentine’s party and I wanted to make something special for him to give out to his little preschool friends. 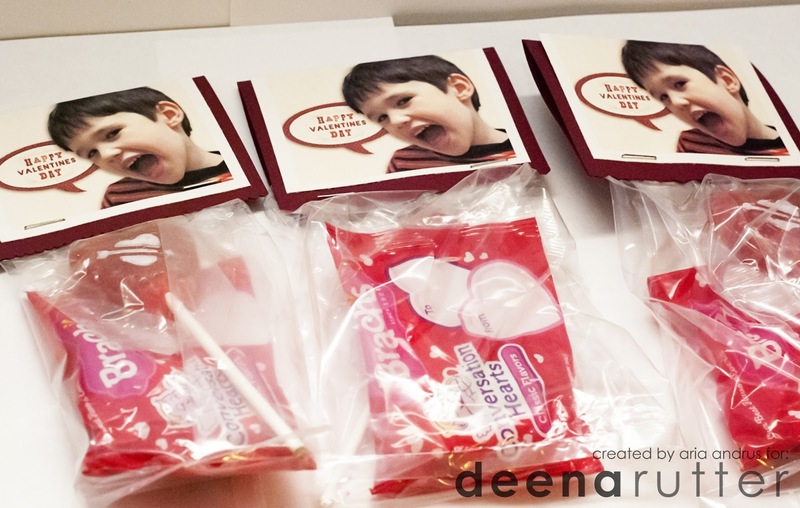 So, I decided to personalize his valentine cards by combining it into a treat bag and putting his face on the card. Use your photo editing software to extract a photo you would like to use. I used the quick selection tool in Photoshop and made sure to use the “Refine Edges” option to smooth around the edges of the extracted photo. Place your extracted photo in a new file. The cards on my treat bags are small so I used the dimensions 2.75 x 4.25 inches. Choose one of your favorite papers as a background. I used a light colored paper from Deena’s Whole Lotta Love kit. Under Custom Shapes in Photoshop, choose the call out mask and resize to your preference (or use the call out mask in Deena's kit). Choose one of your favorite papers and use a clipping mask to clip it to the custom shape. Next, I used the “Happy Valentine’s Day” greeting from Deena’s Whole Lotta Love photocards, used the elliptical marquee tool to select around it and then copied that layer to my card file. Then, place that on top of the call-out mask custom shape. After you’re done arranging things in Photoshop, it’s time to print out your cards and trim them. I decided to back mine with a darker, fuschia colored cardstock and on some of them I got out my old dusty crafting scissors and created a decorative trim for the bottom of the cards. Then fill your treat bags and staple everything together! Easy peasy! 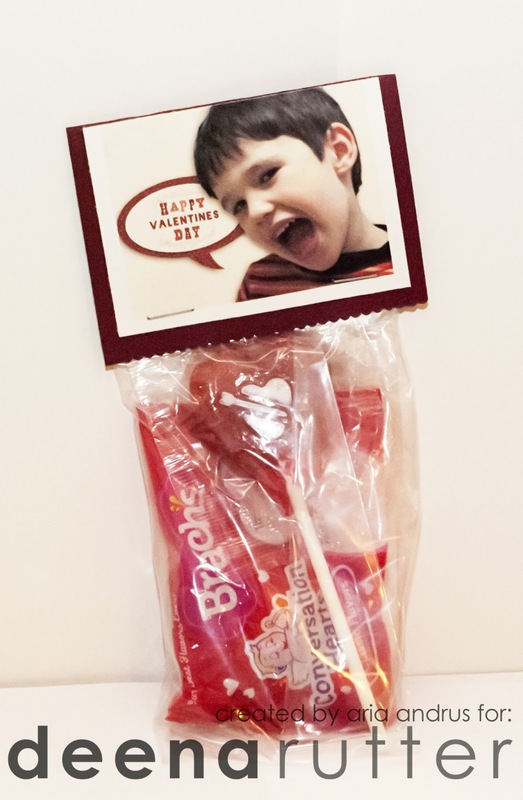 You’ve created a personalized valentine card and treat bag for your kids! Don't you just L-O-V-E Valentine's Day? It's such a wonderfully fun day to celebrate and a great reason make cute~sy crafts! 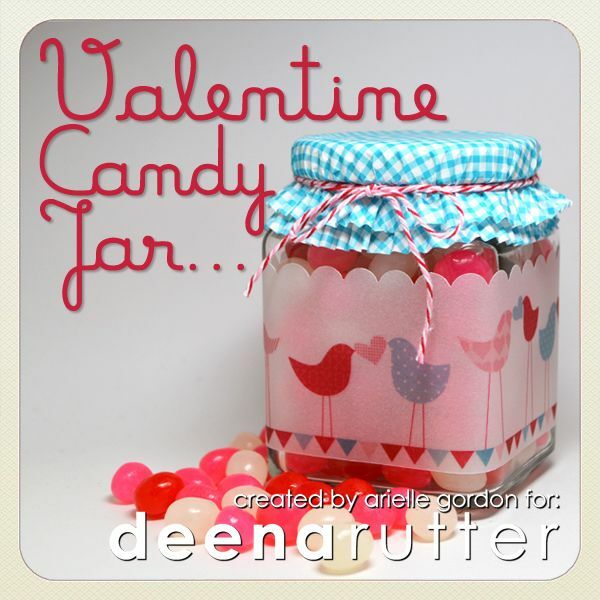 This Valentine Candy Jar is one of those projects you can do last minute, you probably already have everything you need! Adhesive - I used adhesive strip. 1 - Measure your jar, height and width around. 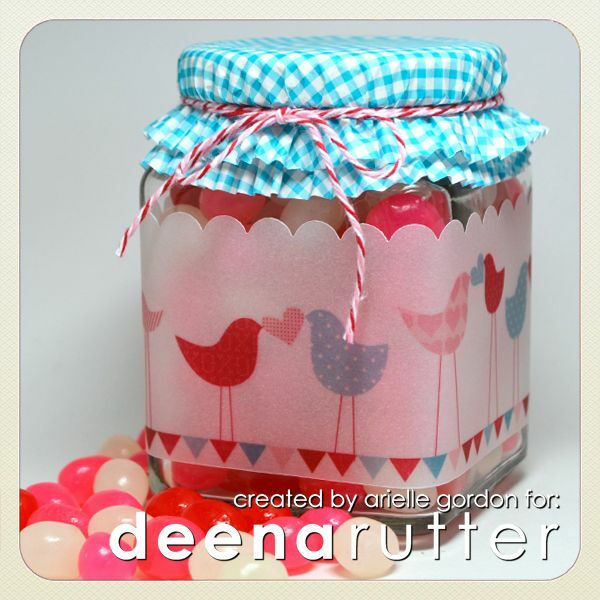 Try to pick a jar that isn't tapered - if it is, you'll have trouble wrapping the paper around evenly. Also try to pick one with a small top - that works better with the cupcake liners. 2 - Layout your label and print. Trim it. I used a scallop border punch on the top of mine. 3 - Place a strip of adhesive on the ends and wrap it tightly around the jar. 4 - Put your goodies in the jar, cover the opening with a cupcake liner that matches your label and screw the top on over it. Put a strip of adhesive on top of the lid, cover with the second liner and secure with your twine or ribbon. 5 - Voilà! You're all finished! Now you can give this cute gift away, or keep it for yourself! Thanks for stopping by and happy hybrid crafting! Happy Friday folks! If you're in the Northeast hoping you're staying safe and warm. In preparation for Valentine's Day next week, we've got two new Valentine's themed releases for you that hit the shop today. Cute, right? Absolutely love the color combinations in this. Grab these two New Releases at 30% off through Sunday. When we said we've been busy working behind the scenes we really have been busy! If you're a fan on Deena's Facebook fan page, go grab your freebie under the Fan Freebie tab. Just our way of saying thanks for your continued support. 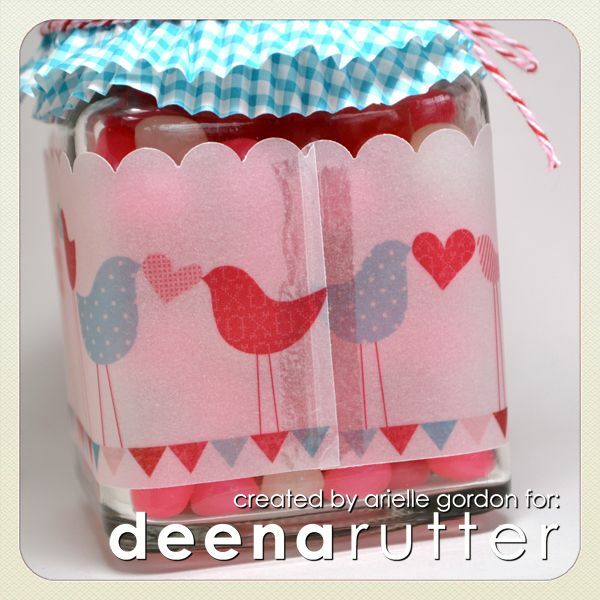 Want exclusive sneak peeks of Deena's upcoming releases? How about discounts? You like those, right? Sign up for Deena's Newsletter and receive 10% off your next order of her products. You can subscribe HERE. 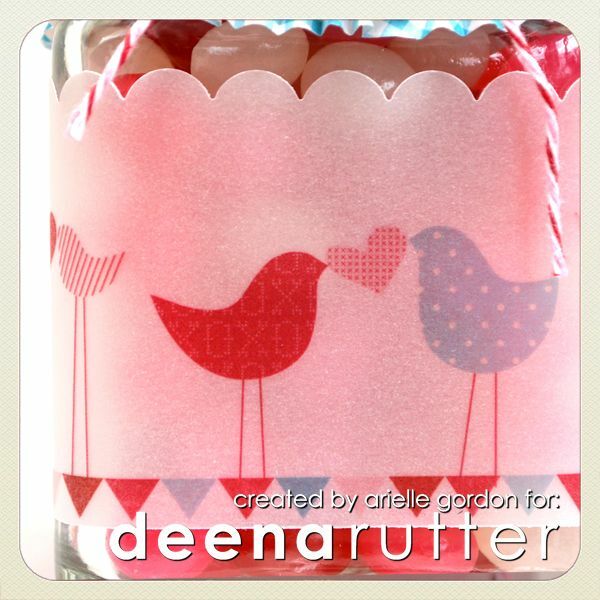 Don't forget that Deena's store is still 30% off through February 10th! We're uploading vintage kits every day! We received a pretty good turnout for the Scoot With Me contest! Thanks to everyone for sharing the news about my new home at Pixels and Company. Now to announce the winners of the contest! Congratulations, ladies! Make sure to comment here with your email addresses so we can send you your prizes. We'll be back tomorrow with some new releases!